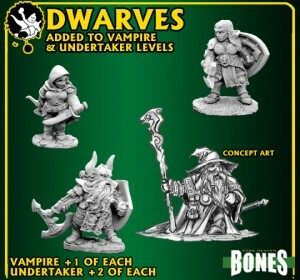 Reaper is showing off some more freebies as their Bones Kickstarter campaign keeps traveling upwards. They're on a roll! Hitting a goal every day since it launched, Reaper's Vampire pledge is now up to 89 minis for $100 and they just revealed a goal that will add 4 more!